Plan B? 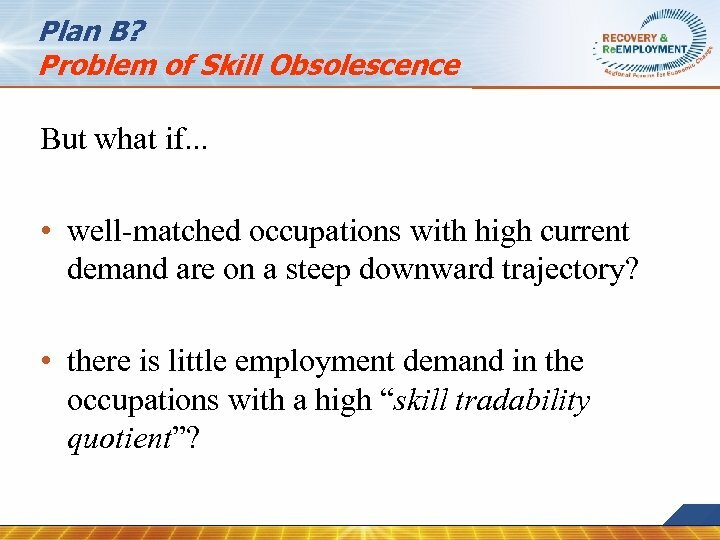 Problem of Skill Obsolescence But what if. . . • well-matched occupations with high current demand are on a steep downward trajectory? 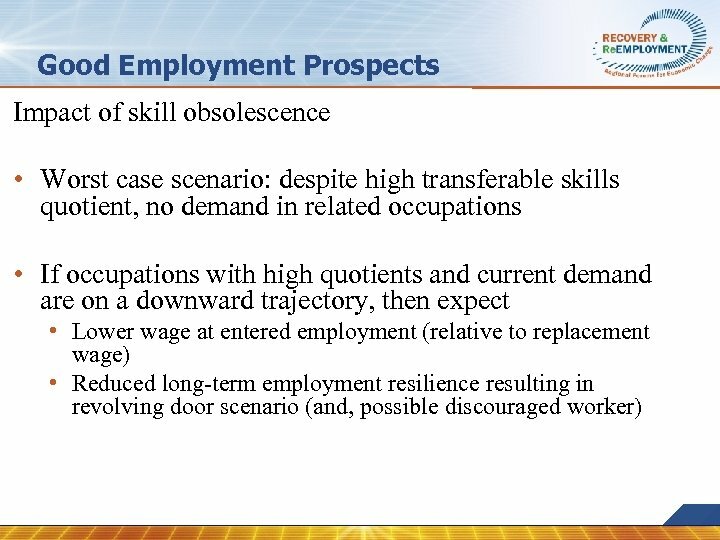 • there is little employment demand in the occupations with a high “skill tradability quotient”? Plan B? 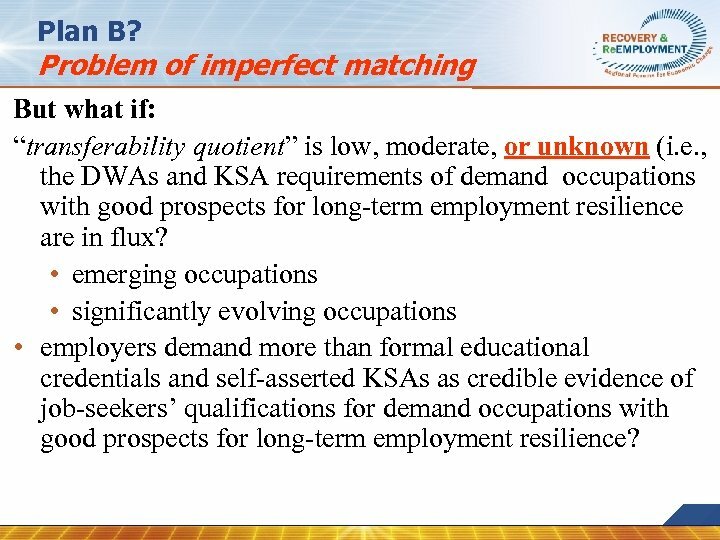 Problem of imperfect matching But what if: “transferability quotient” is low, moderate, or unknown (i. e. , the DWAs and KSA requirements of demand occupations with good prospects for long-term employment resilience are in flux? 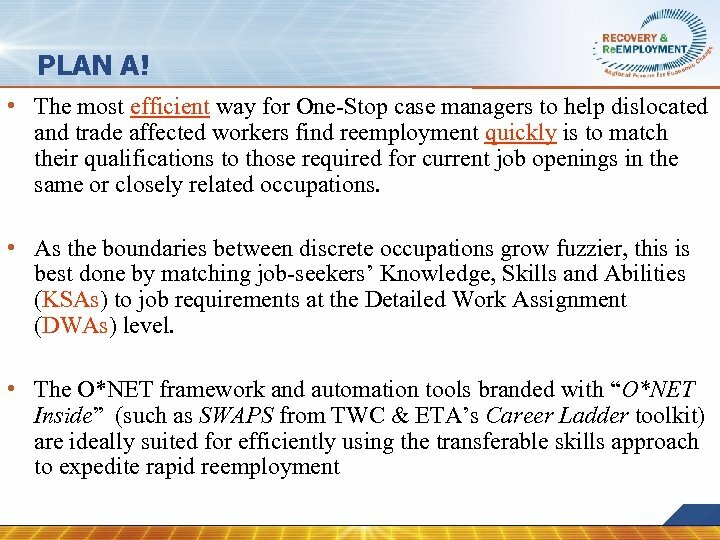 • emerging occupations • significantly evolving occupations • employers demand more than formal educational credentials and self-asserted KSAs as credible evidence of job-seekers’ qualifications for demand occupations with good prospects for long-term employment resilience? 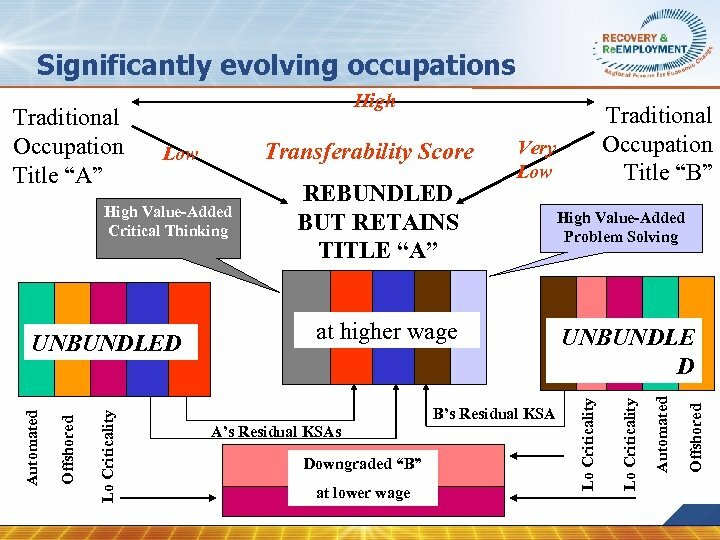 Emerging Occupation Transferability Unknown DWAs Unsettled • No Standard Operating Procedures • Trail and Error Process Innovation • Disruptive Innovation • Novel Product or Service • Unprecedented Processes KSAs Unsettled • Tacit Knowledge Taking Shape • Multi-Disciplinary Spillovers • Direction of Technology Convergence? ? 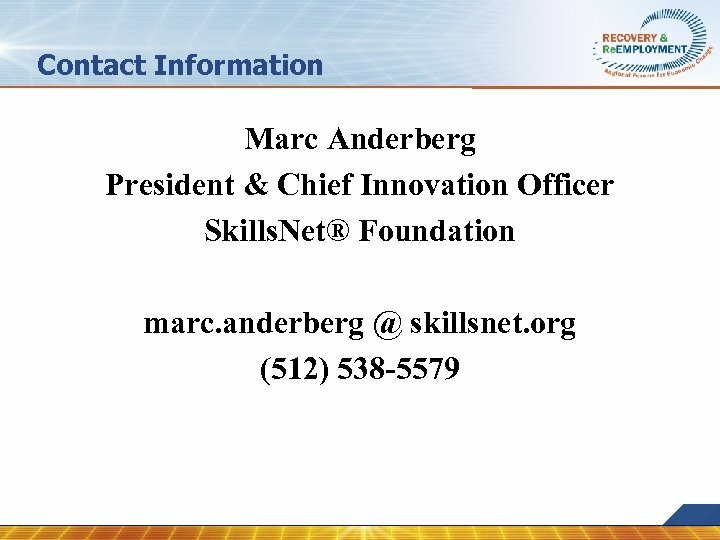 Problems with formal educational credentials • If not recent, are the KSAs out of date? 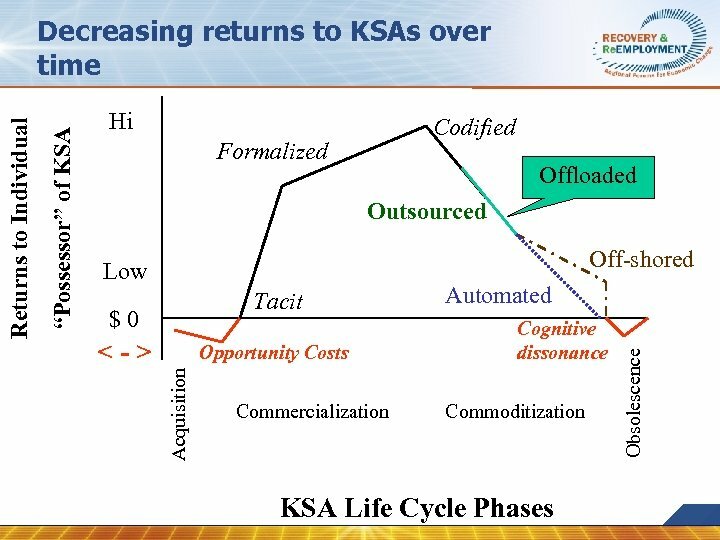 • Even if recent, was the curriculum built around employer-identified KSA requirements as expected learning outcomes? (i. e. , relevance) • Were grades (KSA assessments) norm-referenced (i. e. , to peers) instead of criterion-referenced (i. e. , to employer-specified proficiency requirements)? • Was assessment “authentic” (i. e. , valid and reliable – based on performance demonstration in real or simulated work context)? Problem with self-reported KSAs • Self-ratings notoriously high • How recently and how frequently were they used? (i. e. , are they rusty? ) • If highly proficient and accurately reported, then are there hidden negatives which undermine the jobseeker’s employability? 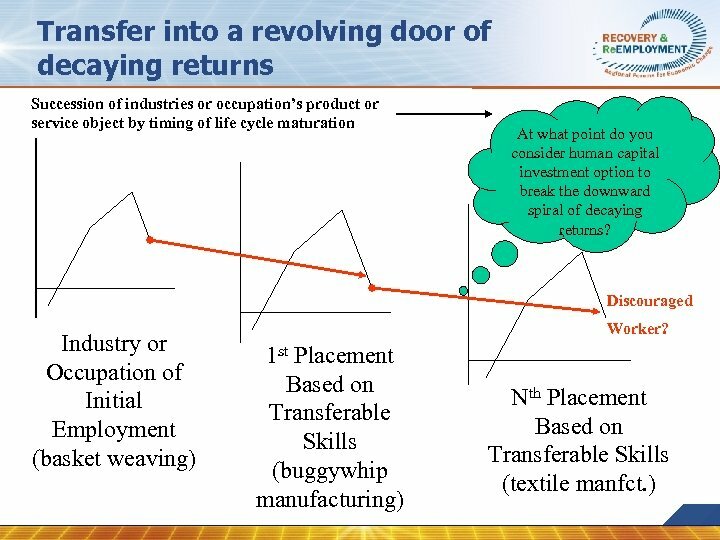 Solutions 1) Invest more in O*NET • Continuous, systematic expansion of O*NET coverage of Emerging Occupations (and purging of dead ones) • Continuous re-evaluation of KSA ratings at the DWA level for evolving occupations (e. g. , frequency and criticality) • Continuous refinement of O*NET content model (e. g. , adding new elements such as “greenness”).